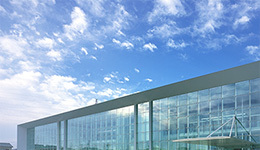 ﻿ Ai-Ring (Proving ground)｜Products and Technologies | Akebono Brake Industry Co., Ltd.
Akebono 's proving ground "Ai - Ring" in Iwaki City, Fukushima Prefecture, is one of the largest facility among automotive parts manufacturers. It features various simulated road conditions and test facilities, including a high-speed oval with a lap length of 3,016 meters, a low friction (“low μ” ) surface road, and a winding road on a massive site exceeding 720,000 square meters. At the "Ai-Ring", various brake tests, from evaluations on a test bench to assessments on an actual car, can be conducted. 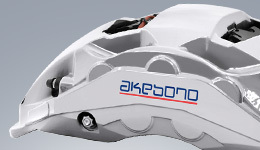 Akebono has started rental of Ai-Ring, proving ground, to outside companies. 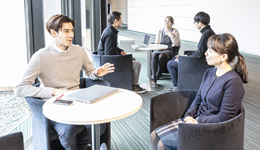 Akebono started rental of Ai-Ring, proving ground (including a service factory), to outside companies from April, 2018. For details, please contact us through “Inquiries Regarding Others” on “Inquiries to our website” page in Akebono official website. Akebono built its first proving ground in the former Iwasaki city in Saitama prefecture in 1967, and relocated to Iwaki-shi, Fukushima prefecture in 1988. Although the proving ground was greatly damaged by the Great East Japan Earthquake of March 2011, primary restoration work was carried out immediately on the major facilities such as the high-speed oval. In December 2012, the new test track was re-opened, along with the name-change from "Proving Ground" to "Ai-Ring." Repair and expansion work was completed in November 2016, and a new Ai-Ring was born. 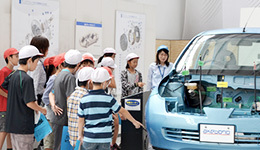 The facility expansion facilitates brake testing and evaluation under real-world conditions of not only Japan but also other regions of the world. Furth more, development speed has been accelerated because it is now possible to carry out the entire testing/evaluation process, from the test bench to the real vehicle, on the same premise. 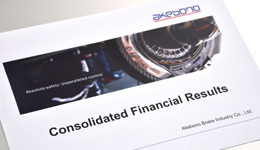 Akebono started rental of Ai-Ring with further expanded test functions, proving ground (including a service factory), from April, 2018. For details, please contact us through “Inquiries Regarding Others” on “Inquiries to our website” page in Akebono official website. maximum test speed 200 km / h.
Total of three types of road surfaces; cobblestoned road, Belgian brick road, and undulated asphalt road. Maximum water depth 400 millimeters. Noise dynamo, bench testing riggings, large and small vehicle repair shop. The lap length of the oval is 3,016 meters, including a 600 meter long straight. There are three lanes; from the inside, the low speed lane, medium speed lane, and high-speed lane. The maximum bank angle is 44 °, which was derived from the necessity to counter the centrifugal forces generated during cornering, for safety at high speeds. The maximum test speed using this bank is 200 km / h. Neutral speed is 157 km / h, at which speed the vehicle travels through the bank without the driver having to turn the steering wheel. The area with low friction (“low μ”) roads and skid pads is called as the comprehensive testing area. The total area of road surfaces is about 30,000 square meters. It is capable of conducting various evaluations, including low speed testing of automobiles, as well as testing of motorcycles, forklifts and other vehicles. Currently it is also used for driver training. A "slippery" test road that simulates road surfaces that are covered with ice or packed snow. It is used mainly for evaluating ABS brakes. There are two kinds of road surfaces, ceramic tile and basalt tile *. Water sprinklers are installed on both sides of the roads to wet the road surfaces. The coefficient of friction of the road surfaces when wet with water is 0.1 for the ceramic tile, and 0.2 to 0.3 for the basalt tile, each simulating slippery conditions on ice and snow, respectively. The skid pad has a diameter of 130 meters. Circles, each with a radius of 50 meters, 40 meters and 30 meters are drawn, so that the influences on braking the vehicle while turning along those lines can be evaluated. The surface of the skid pad can be made wet, similarly to the low friction (“low μ” ) roads. Water sprinklers are installed along half the outer circumference, so that water can be sprayed from one side. The sprayed water flows to the opposite side as well, thanks to the 0.5% gradient on the road surface. Finally, the water flows into the reservoir for reuse at a later time. Built inside the existing oval as part of the expansion that started in 2013, the total length of the road is 1,533 meters and the elevation difference is 23 meters. The thermal characteristics, such as heat buildup in the brake system and cooling capacity, are evaluated using the consecutive turns and elevation differences. Various driving situations which are tough on the brakes are replicated, including turning while climbing or descending, and making continuous turns before stopping. Both clockwise and counterclockwise driving are possible, and in the counterclockwise direction there is a straight downhill slope, enabling evaluation at higher speeds. This test road is built after public roads and mountain roads, and was designed to replicate real world roads, taking advantage of the original landscape. As part of the expansion from 2013, the number of test slopes was increased from three to eight. The steepest gradient in this slope is designed to match the maximum hill climbing ability of a vehicle at 35%. To cope with the various testing needs, there also are other types of slopes, including the 20% gradient slope which is the legal testing requirement for passenger cars, the 18% gradient slope which is the standard gradient for truck evaluation, and the gentler test slopes with a gradient of 5% plus which are used to evaluate braking under lower loads. The rough-terrain roads are used to evaluate the influence on brakes when braking on undulated road surfaces. During the expansion project starting in 2013, the cobblestoned road, Belgian brick road, and undulated asphalt road were renewed. Nine types of cobblestones with different heights and sizes are used for this test road. By changing the number, height and arrangement of the cobblestones, it is possible to replicate various road surfaces. The Belgian brick road is designed to replicate the roads paved with setts, or rectangular quarried stones, seen typically in some of the European cities and towns. In fact, the European road has been recreated faithfully to its original construction by selecting used stones from actual European roads, and also using the same manholes that are used locally. The undulated asphalt road replicates paved roads with uneven surfaces. This test road enables the evaluation of brakes when running on gaps and bumps, which drivers sometimes encounter on worn out asphalt pavement. All the trees harvested for building the proving ground were made into wood chips with a crusher and reused 100% by blowing them on the sloped terrain to suppress soil loss, thereby realizing zero emissions without waste. By sowing the seeds collected during logging, the greenery of the premise has been enriched. There is a solar power generation system with a total power generation capacity of 40 kW on the site, for supplying electricity to facilities that are heavy consumers of electricity, such as dynamos. This system also stores electricity, so that in the event of a power outage, it can supply electricity to office functions, such as the network server, for about seven hours.